Based on astonishing case studies, this is a brilliant and beautifully written follow-up to Dr Doidge's record-breaking bestseller The Brain That Changes Itself. In his first book, Norman Doidge described the most important development in our understanding of the brain in four hundred years: the discovery that the brain can change its own structure and function in response to mental experience - what we call neuroplasticity. Now The Brain's Way of Healing shows how this amazing discovery really works, significantly broadening the field from traumatic brain injury to all manner of diseases and conditions in which brain functioning is a factor - including multiple sclerosis, Parkinson's disease, epilepsy, cerebral palsy, and dementia - and describes how patients have retrained their brains and learned to walk, speak, or hear, while others have reset the brain's energy patterns and circuits to overcome or reduce chronic pain or alleviate anxiety, trauma, learning disorders, and many other impairing syndromes. 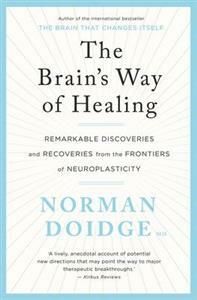 As he did so lucidly in The Brain That Changes Itself, Norman Doidge presents exciting, cutting-edge science with practical real-world applications, and illustrates how anyone can apply the principles of neuroplasticity to improve their brain's performance.